Vaku-8 & Vaku-8+ Safety Blood Collection Set with safety shield for accessing difficult veins for blood sampling by utilizing the wings to control needle placement. The wings ensure no trauma due to rolling of needle and minimizes the chances of vein perforation. Distal vein wall puncture aside from causing patient discomfort due to repeated pricks can result in increased chances of Phlebitis and other related problems. A non latex rubber sheath envelops the needle of the multiple sample adaptor, automatically retracting as the needle penetrates the vacuum tube stopper, and upon withdrawal recovers the needle. This sheath helps in avoiding accidental needle sticks to the person using it, and avoids blood spillage. The screw thread below the needle of the multiple sample adaptor fits to any standard vacuum tube holder. 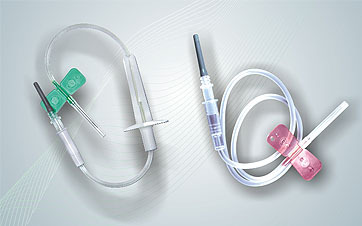 With Vaku-8+, there is a safety shield for covering the needle post-use to prevent accidental needle stick injury. In winged collection set apart from drawing, infusion can be also given. Chances of vein cross perforation are minimized due to comfortable placement of wings, and rolling of the needle is avoided. During the Phlebotomy ,once the Phlebotomist puncture the vein, instant flash back of blood is seen in the PVC tubing thereby confirming successful Phlebotomy. If in the PVC tubing blood is not seen then the Phlebotomist has to redo the Phlebotomy. Any lateral movement while holding/handling the blood collection tube with a standard needle can cause trauma or vein perforation. The flexible tube in Vaku-8 & Vaku-8+ allows the freedom of movement and minimizes the risks. FLEXIBLE WINGS with textured surface easily punch together to provide a secure grip. NEEDLE is with short bevel which minimises chances of vein perforation. KINK-RESISTANT TUBING assures continous flow. FEMALE LUER LOCK Connector for secure fitment. 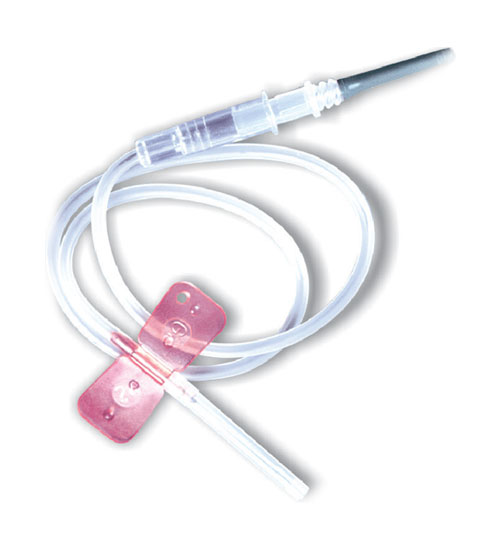 SELF SEALING NON LATEX PROTECTION SHEATH automatically cover needle before & after insertion. PROTECTIVE SHIELD in VAKU-8+ ensures there are no secondary needles sticks and no reuse of devices. SCREW THREADS below the needle can fit in any standard vacuum tube holder.